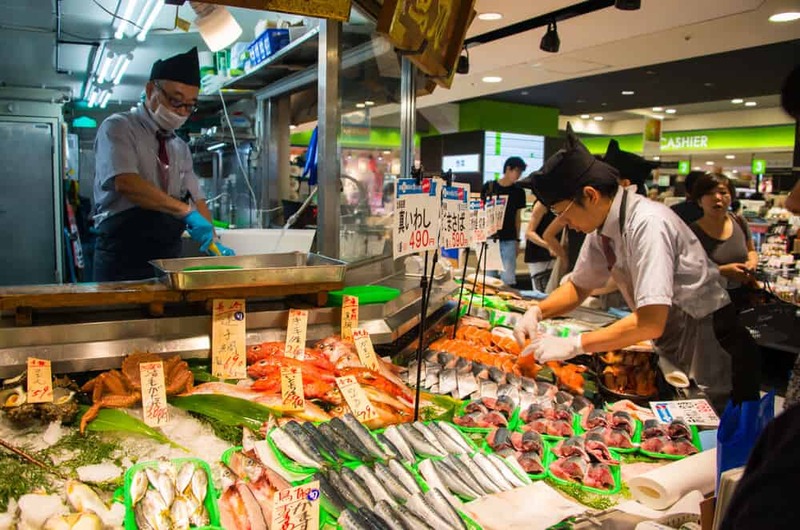 Tsukiji Fish Market is an unlikely seeming tourist attraction. A wholesale fish market, even if it is among the biggest and busiest in the world, doesn’t exactly sound exciting. 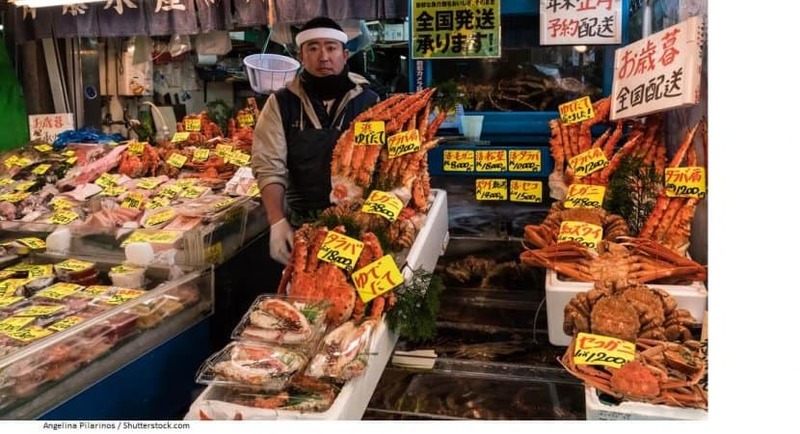 But Tsukiji Fish Market has attracted so many tourists that it has had to take measures to curb the number of visitors it attracts each day. Why the attraction? My guess is authenticity. The Tsukiji Fish Market began in the Edo-period in Nihombashi, moving to its present location in 1935. Some of the market buildings are over eighty years old. The market is clearly designed for wholesalers rather than tourists, and priority is given to those there to do business. Yet, that very business and the lively activity it inspires keeps the tourists coming back. 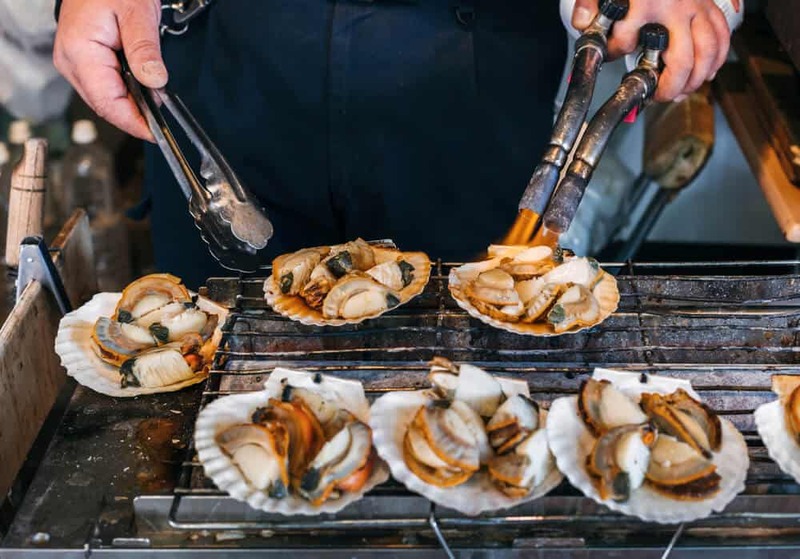 Over 2,000 tons of seafood passes through Tsukiji on a typical day, and the resulting bustle opens a window onto the importance of freshness and quality to Japanese cooking. 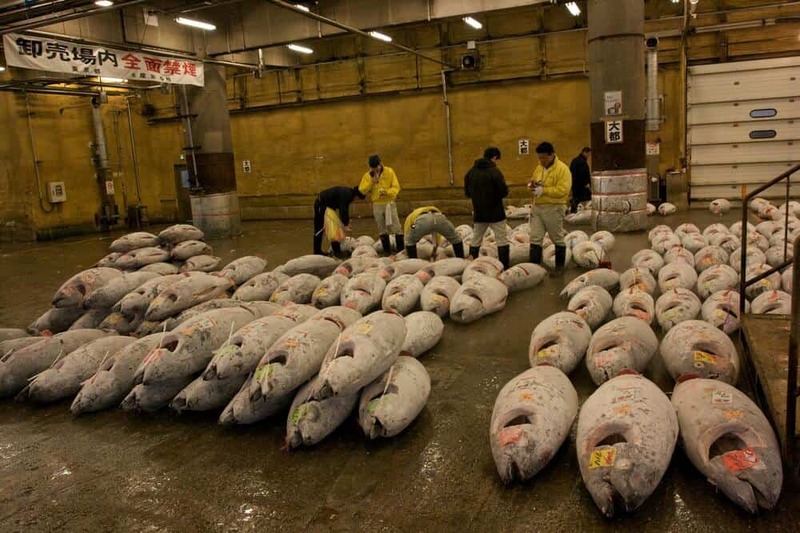 The tuna auction that takes place in the main wholesale market, located within the Inner Market is Tsukiji Market’s main attraction. The first tuna auction of the New Year has special significance, and the first fish up to auction often goes for an exorbitantly high price. 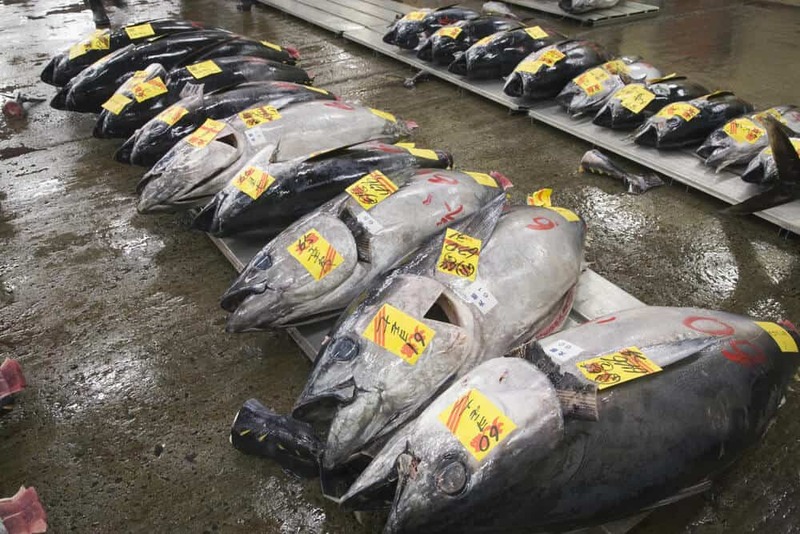 In 2013, the winning bid was a record-breaking 155 million yen, and the 200kg tuna went to a prominent sushi chain. 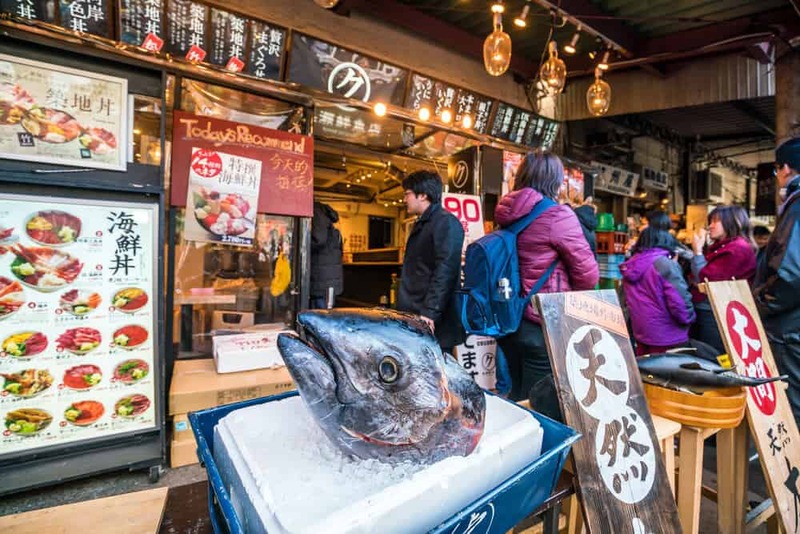 Unfortunately, the high interest garnered by the New Year’s auctions means that Tsukiji Market often closes its doors to tourists in January. Entry to the tuna auction is limited to two groups of 60 people per day and allotted on a first-come-first-served basis. It’s not unusual to hear tales of tourists arriving at 5:00 A.M. only to find all of the slots filled. Some visitors recommend arriving as early as 3:00 A.M. (1:00 A.M. during peak tourist season) to grab a place. The two auction times are between 5:25-5:45 A.M., and 5:50-6:10 A.M. Registration begins at 5:00am, at the”Fish Information Center” on the 1st floor. (Near the Kachidoki Bridge entrance). If you are lucky enough to witness the auction, dress warmly! The tuna are frozen ahead of the auction, and it can be very cold. Before the auction gets underway, the tuna are sorted, inspected, and a small slice of flesh is put on display. Visitors should stay out of the way in the designated watching zone, and avoid flash photography—in the past, the flashes have blinded the auctioneer and prevented bids being acknowledged! The auction is hard to understand, even for Japanese speakers. Instead of trying to make sense of the chant, simply enjoy the sights and sounds. Once the tuna auction is finished, you can wander through the market, taking in the fresh seafood on display. I consider this worth the trip, even if you can’t make the auction. Photographers will find much to appreciate! I’d never considered seafood beautiful, but the displays of fresh fish, scales gleaming, kept my camera busy the entire trip. Watching the massive tuna be carved up into easier to handle portions is a sight in itself. The wholesale fruit and flower auctions and sales are held in another building within the Inner Market. If you miss out on a place in the tuna auction, the Inner Market opens to visitors from 9:00am. There’s still plenty to see, even if the main business for the day is over. The market wraps up around 10:00am. You can visit the Outer Market at any time, with the majority of stalls open for business around 09:00 A.M.
Shops and stalls sell a variety of food related goods, including kitchen utensils and fresh produce in smaller portions. The knives, in particular, are good investments as they are restaurant quality at decent prices. Delicious teas, Japanese style clothes, and serving dishes are also sold in the outer market. 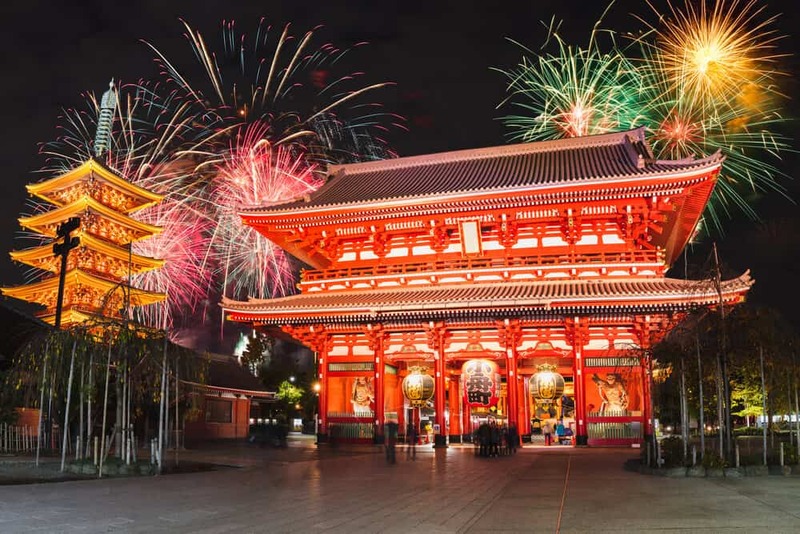 There are a few souvenir stalls, where you can find gifts for people back home, and food stalls for a quick bite to eat. 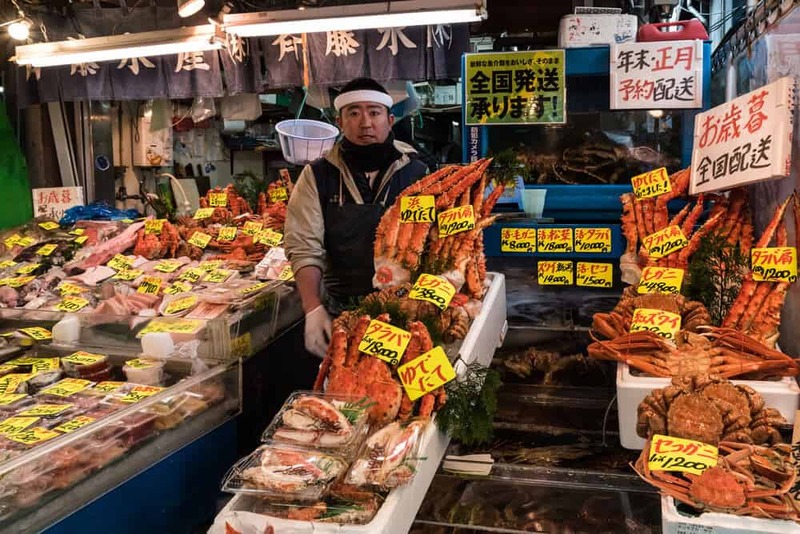 All the seafood on display at Tsukiji will whet your appetite for some sushi, but don’t be too quick to take a seat in one of the Outer Market’s many sushi restaurants. 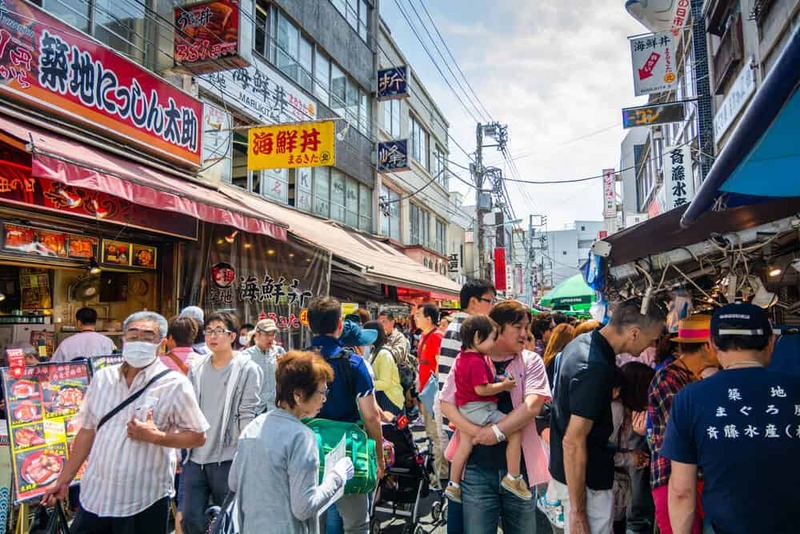 The tiny streets of the Outer Market have a ton of food stalls that will tempt you, whether you’re looking for a meal in a hurry, a quick snack or even something sweet to finish off your sushi meal. There are all the usual suspects—steamed pork buns and Chinese style dumplings, noodles, onigiri, rice crackers, ice-cream and tai-yaki, a cross between a pancake and a waffle, made in the shape of a fish and with a variety of fillings inside. Although you can’t beat the classics—Choku Soba Ramen, right on the edge of the market, always gets good reviews—I suggest saving room for Tsukiji specialties, street food that you will not find as easily elsewhere. Grilled skewers are common throughout Japan, but I’ve never seen tuna steak skewers anywhere besides Tsukiji market. What better way to sample the fruits of the tuna auction than this? You can also try oyster, scallop and unagi, the Japanese freshwater eel. 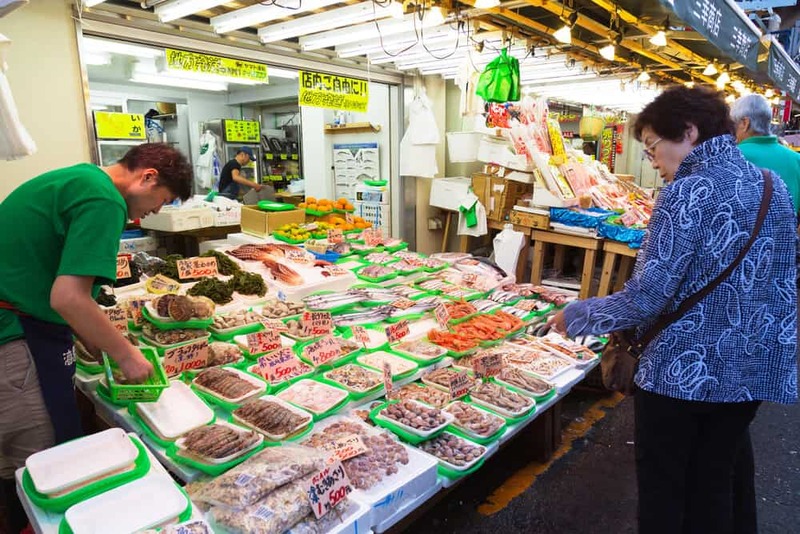 Fish cakes are not to everyone’s liking, but Tsukiji market is a cheap way to discover whether or not you have a taste for them! Grab a bag from one of the vendors and share with a friend. Finally, one of the stores that specializes in making the omelets used in sushi sells ready to eat portions of those same omelets fresh off the grill. Don’t waste time trying to decide what to get. Once the food sells out, that it’s for the day. The market can be over as early as 1:00 P.M. 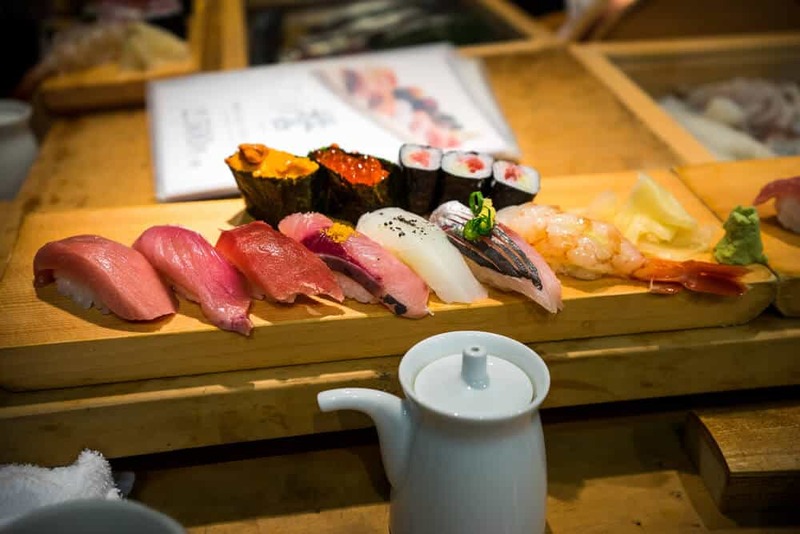 Without a doubt, sushi is the highlight of the Tsukiji Fish Market’s many restaurants. 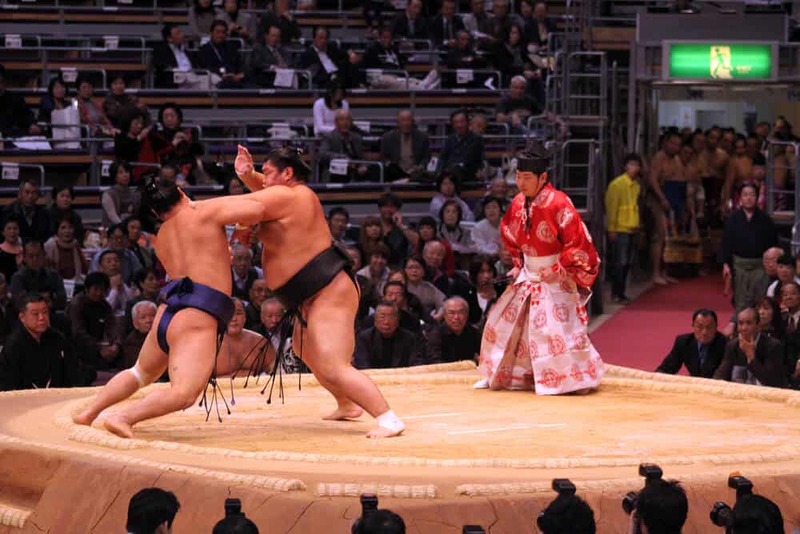 Sushidai is widely considered the favorite, attracting huge crowds, which leads to huge lines. Those who can tolerate the hours of waiting give it rave reviews, citing the friendliness of the chefs, the experience of seeing the sushi prepared before them, and, of course, the delicious finished product. Sushidai is open from 10:00am – 4:00am Monday-Saturday, and 11:00am – 10:00pm on Sundays and public holidays. If you’re not in the mood for hours of waiting or need some help identifying what exactly you’re ordering, then head to Sushi Ichiban. The sushi is good, and there is an English menu to help you make your choice. The staff speak pretty good English and are willing to help you if you need it. Sushi Ichiban is open 24 hours, Monday-Sunday, making it a good choice if you need something to eat while you wait for the market to open. Sushi Zanmai was Japan’s first twenty-four-hour sushi restaurant. Like Sushi Ichiban, it is a good place to visit if you arrive very early for the auction. Sushi Zanmai also has an English menu. Its specialty is its tuna, with a reputation for supplying tasty, quality cuts of tuna at very affordable prices. Order the maguro-zanmai (3240 yen), for a sampling of the many ways Sushi Zanmai serves tuna sushi, including choice cuts of fatty tuna, lightly grilled tuna with a variety of toppings, and lean tuna. If you’re not in the mood for sushi, then Nakaya, a donburi shop, allows you to enjoy Tsukiji’s fresh produce in a different way. 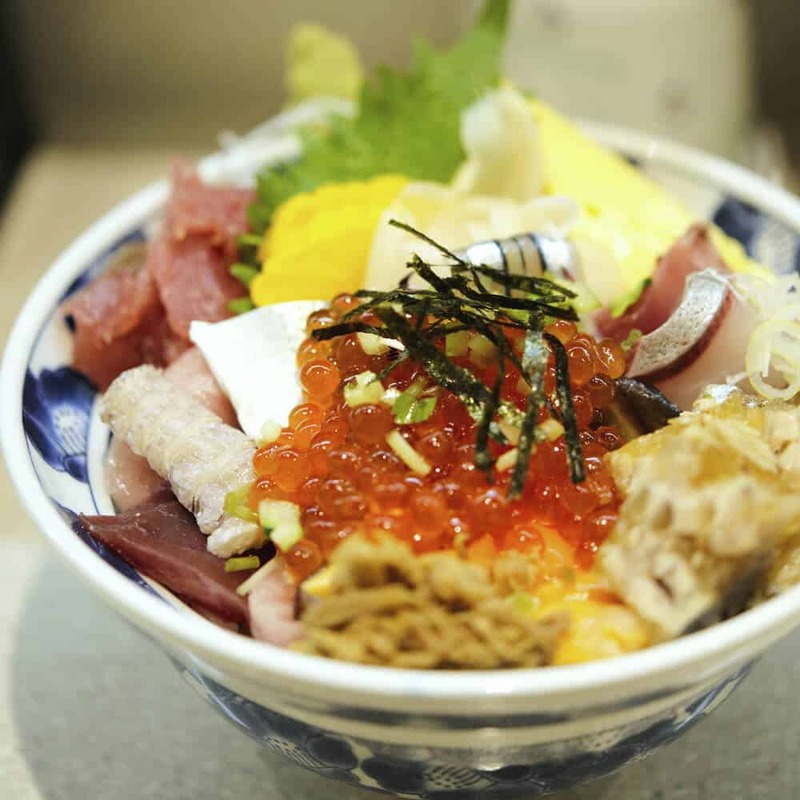 A donburi is a bowl of rice served with a variety of toppings. 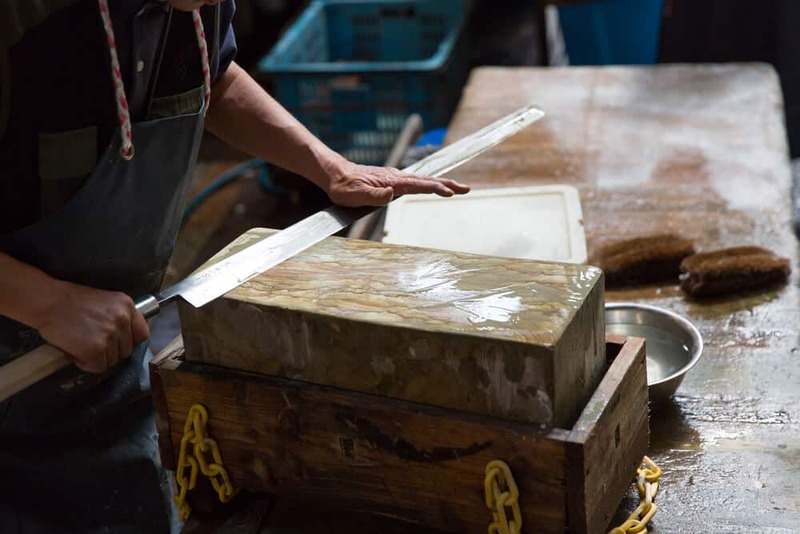 In Nakaya’s case, these tend to be slices of fresh fish and roe, with a garnish of spring onions or a dab of wasabi (spicy horseradish paste—you may have encountered it with sushi!). Nakaya’s rice bowls come with a side of miso soup and some pickles. Service is brisk, with staff taking orders from customers waiting outside at peak hours. While this means you get fed as soon as you sit down, it doesn’t make for a relaxed dining experience. Taking photos of your food is okay, but photos of the staff or restaurant are prohibited. Nakaya is open from 5:00am – 2:00pm, closed Sundays. 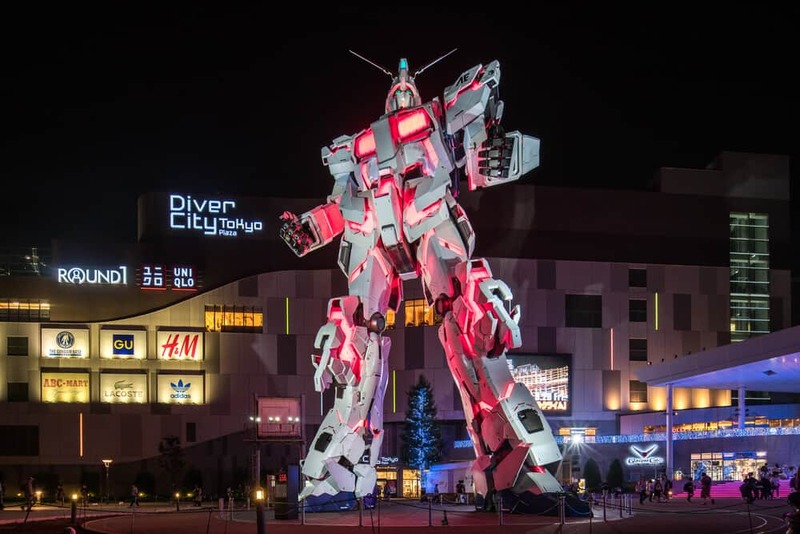 Although not a typical tourist attraction, this slice of Japanese life is absolutely fascinating. I saw fish I couldn’t identify, and was astonished at the sheer size of the tuna. Finally, as a big fan of sushi, I thoroughly enjoyed my sushi breakfast! The early start was a struggle, but we emerged from Tsukiji fish market energized and pumped for the day ahead of us. 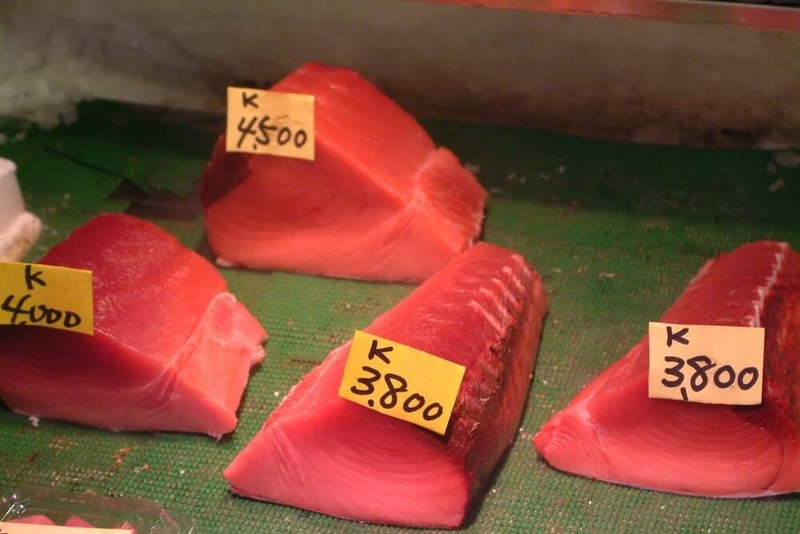 The Inner Market opens at 5:00am, with the two tuna auctions taking place from 5:25-5:45am, and 5:50-6:10am. It is then closed to tourists until 9:00am, as the wholesale business of the market gets underway. 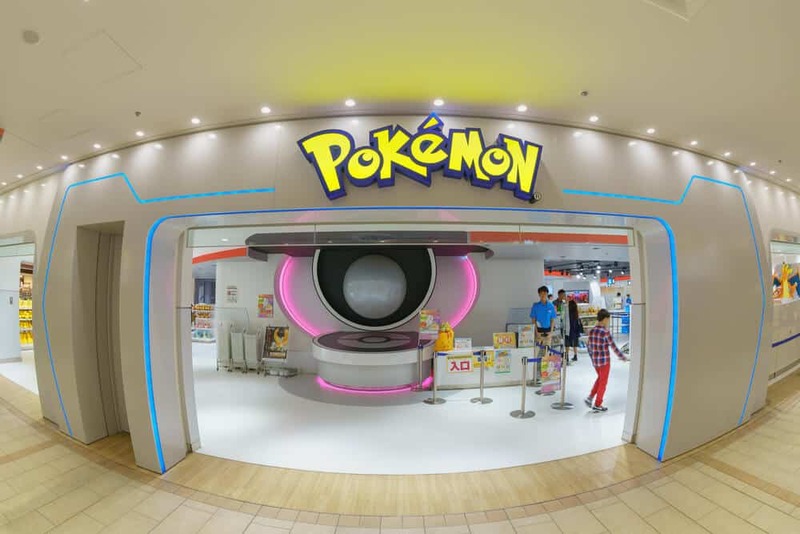 It reopens again between 9:00-10:00am. The Market is closed Sundays and some Wednesdays. The best time to shop in the Outer Market is from 9:00am – 1:0pm Many businesses close on Sundays with the Fish Market, making Saturday the busiest day to visit. 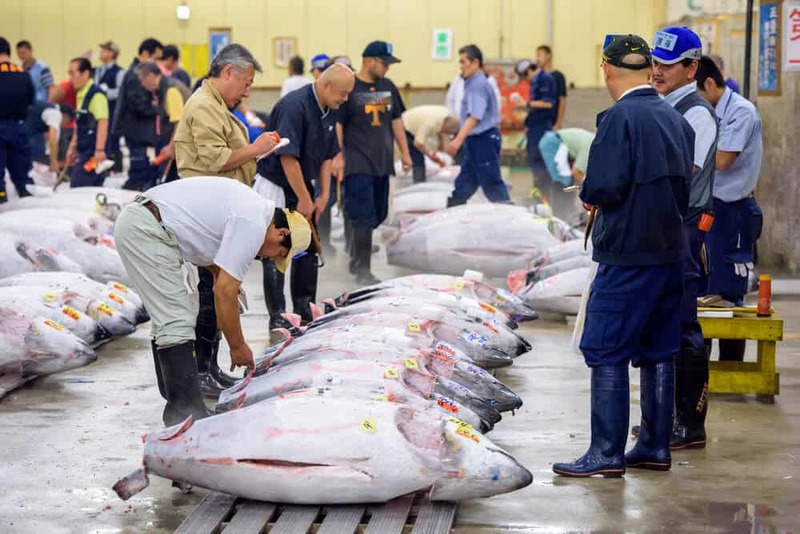 Because Tokyo trains stop running at 1:00am, and don’t start again until 5:00am, travelers wanting to get to Tsukiji in time for the tuna auction have a logistical challenge ahead of them. 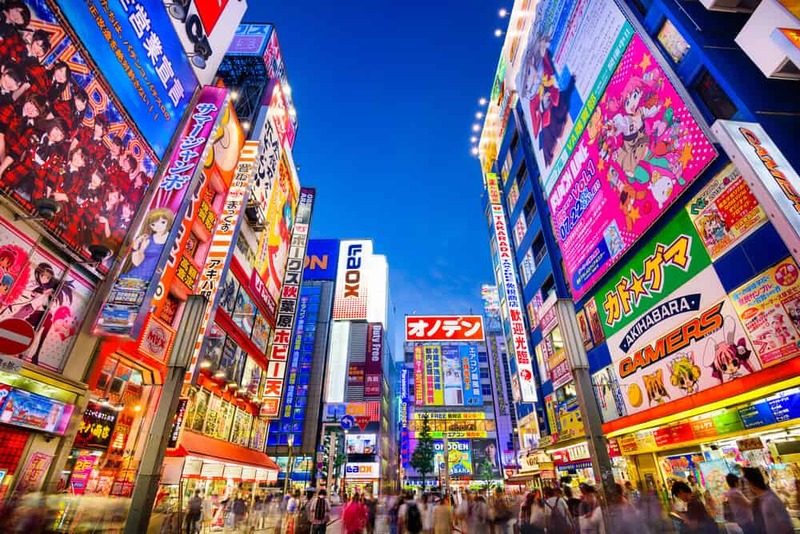 Either sleep at your hotel and get a taxi to the market (arranged ahead of time), or, if your hotel is nearby, avoid the twenty percent surcharge on night taxis and walk. The other alternative is to stay up late. 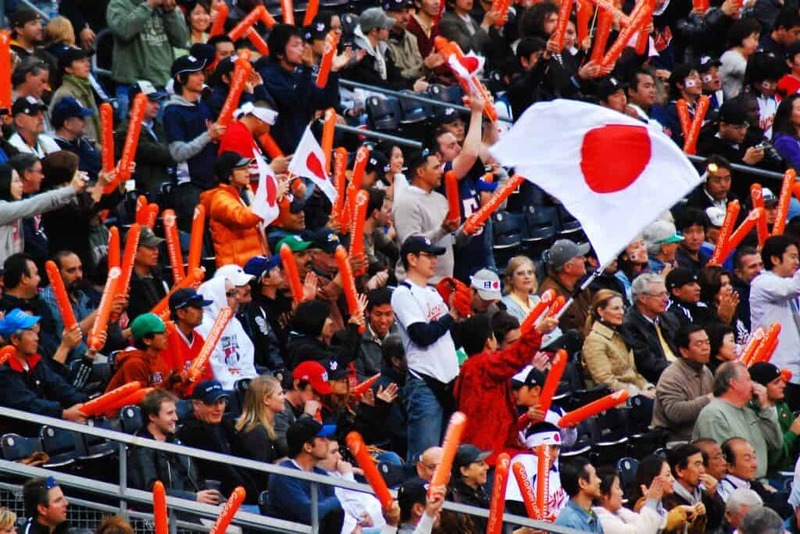 Instead of heading to Tsukiji after a night out (the busy atmosphere and fishy smells do not make it a good choice for anyone even slightly hung-over), consider parking yourself at a nearby family restaurant. These 24-hour restaurants let patrons stay for hours, so long as you’ve purchased something and are not inconveniencing other visitors. There is a Dennys and a Jonathans near the Tsukiji Station. 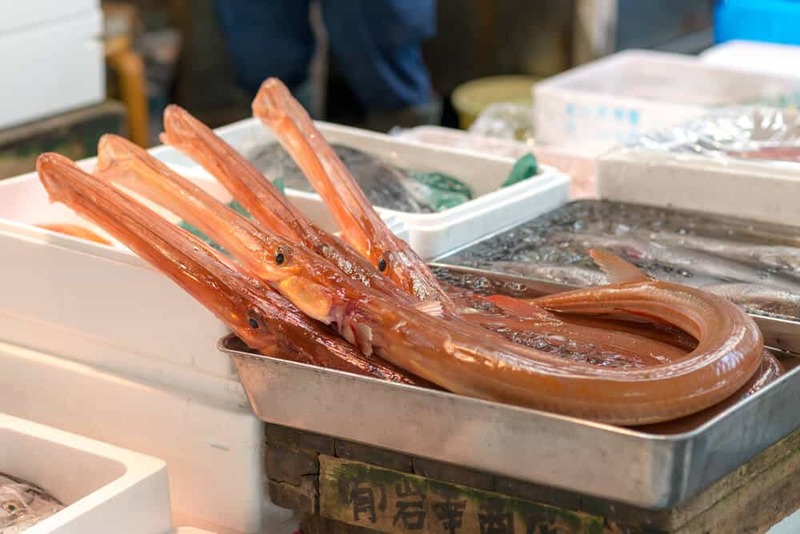 Tsukiji Market, Inner and Outer, are entirely free to visit. Entrance to the tuna auctions are restricted, but not charged. Because the local wholesalers do not gain anything by opening their doors to tourists, it is very important to respect their place of work and obey the rules of the market. 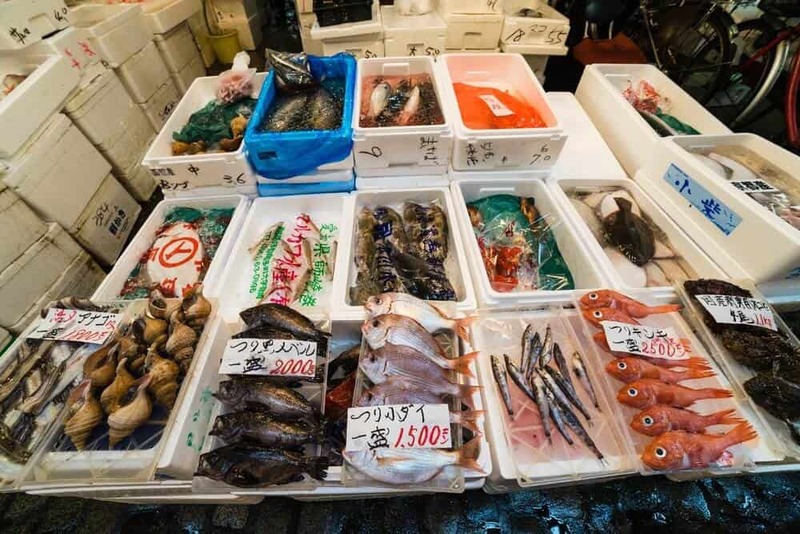 Tsukiji Market is a 5-minute walk from Tsukiji Station on the Tokyo Metro Hibiya Line. 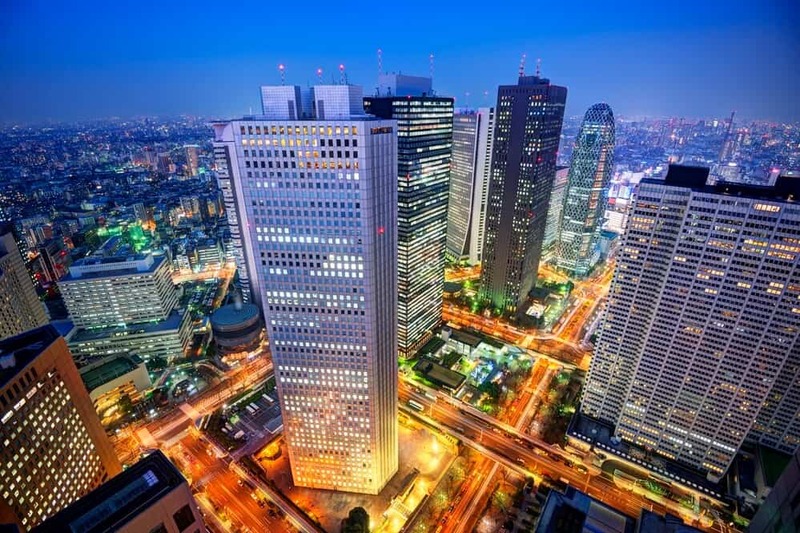 To get there from Tokyo Station take the Marunouchi Metro Line to Ginza, and change to the Hibiya Line in the Kita-Senju direction. The journey costs 170 yen and takes roughly 9 minutes (depending on the time of day). 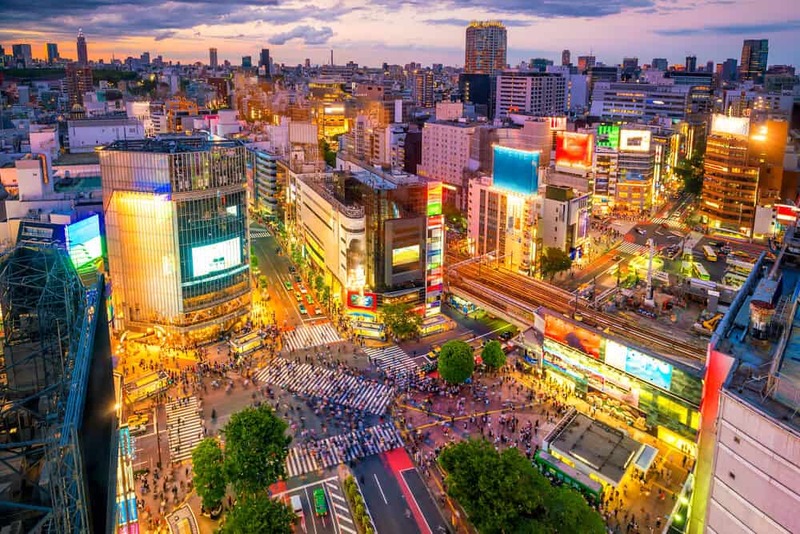 Alternatively, the Market is a 7-minute walk from the Tsukiji-Shijo Station on the Toei Subway Oedo Line. Travelers coming from Shinagawa can transfer from the JR Lines at Hamamatsucho by walking to Daimon, and resume their journey on the subway. From Shinagawa Station, it takes 16-minutes and costs 340 yen each way. 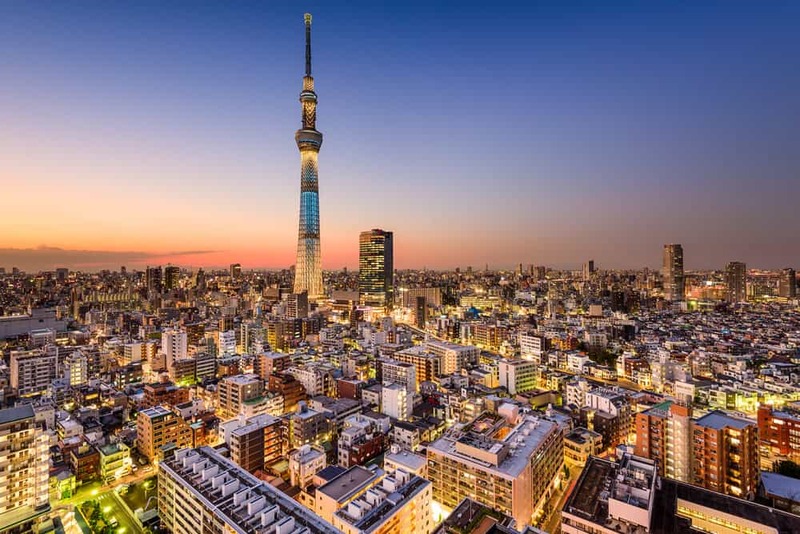 Tsukiji Market is 5 kilometers from Tokyo Station, making it a 17-minute taxi drive from Tokyo station (depending on traffic conditions). 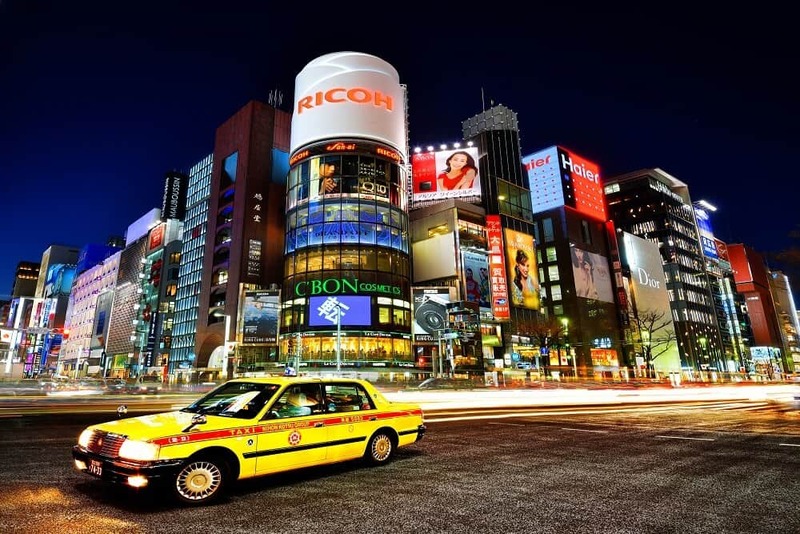 The cost of the journey by taxi is roughly 1800 yen. Don’t act like a tourist! As you wander the narrow corridors between stalls, remember you’re in a place of business. Workers are constantly passing, sometimes driving heavy machinery. Keep an eye on your surroundings, and be ready to move out of the way when needed. Sensible shoes are a must (i.e. toes must be covered), and no food and drink can be consumed near the displays of fish. 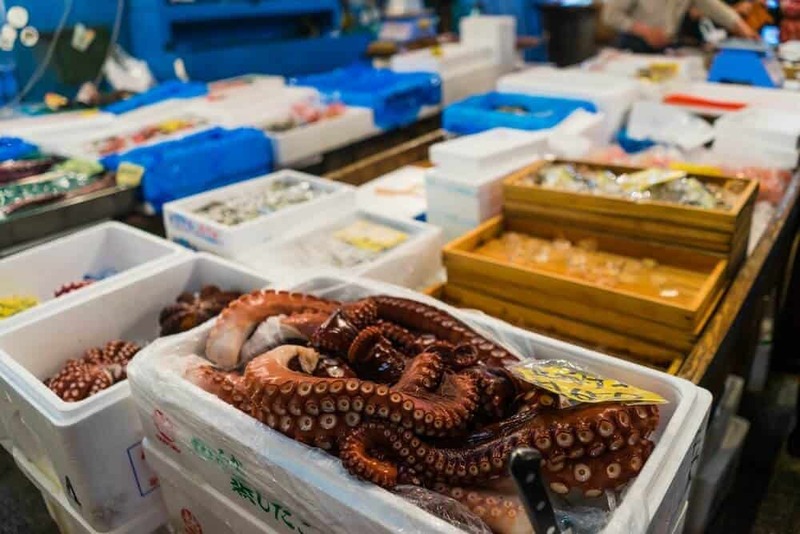 Luggage needs to be left in a locker or your hotel room—there simply isn’t any room for it within the market, and there are very few storage options at Tsukiji Market itself. Avoid the market if you have small children, as it can be dangerous for them. If you have an infant and need to use a baby stroller, definitely avoid going to Tsukiji Market. In addition to the crowds of people and workers whizzing past you with machinery, the small streets and paths make it very difficult to navigate with a baby stroller. 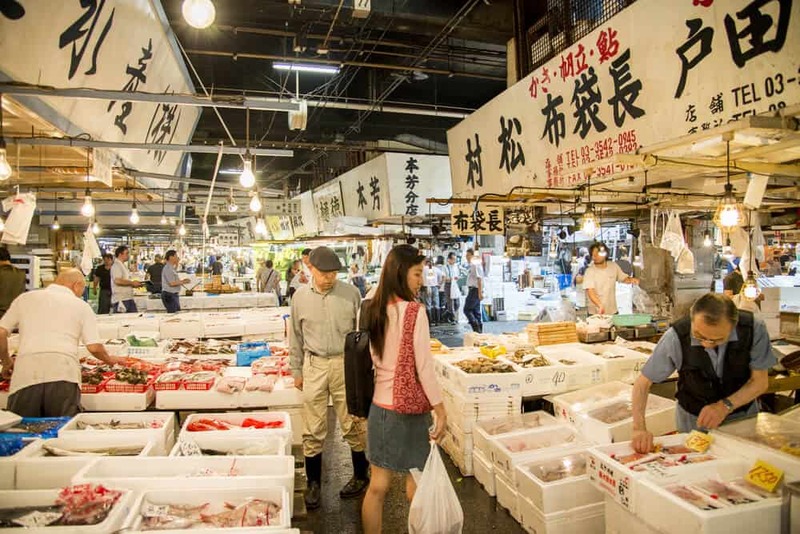 Tsukiji Market is set to move to a new location in Toyosu late 2017. Before planning your visit, check the official site to make sure it is open. If you want an inside look at what truly goes on behind the scenes at Tokyo’s most famous fish market, check out this fascinating documentary by NHK. 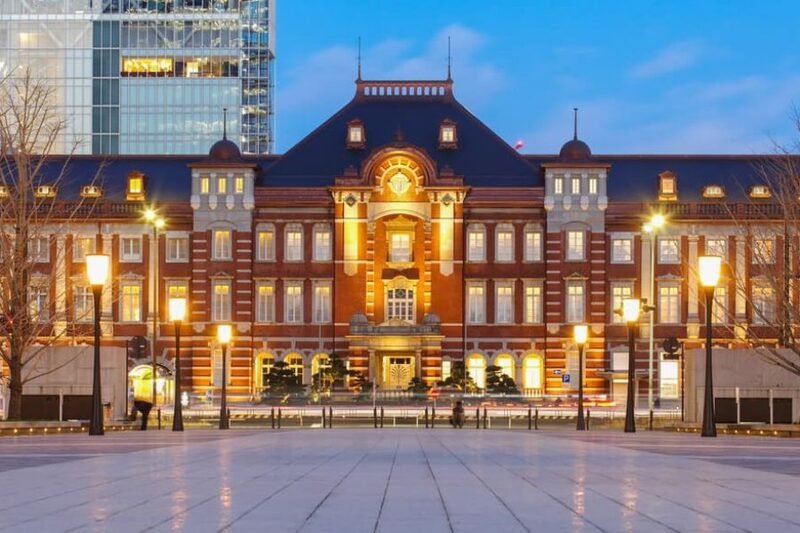 Is the Japan Rail Pass Worth It? What Are My Other Options? 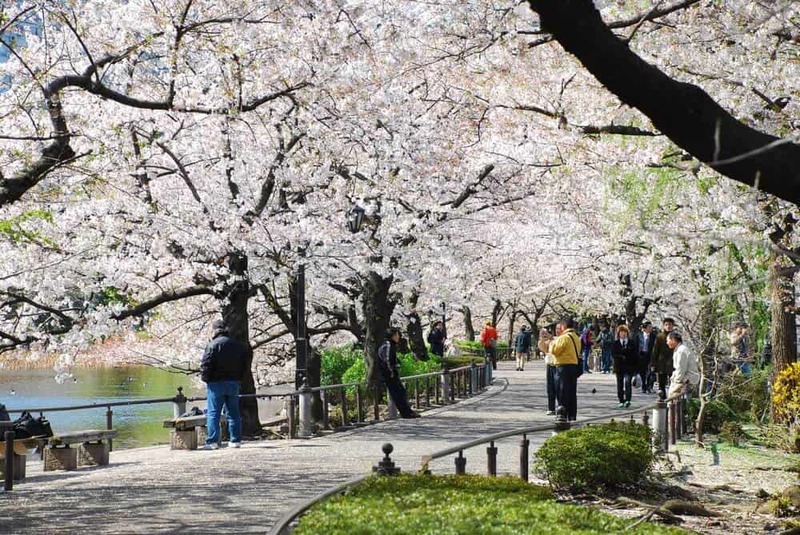 Is Osaka Castle Worth Visiting? 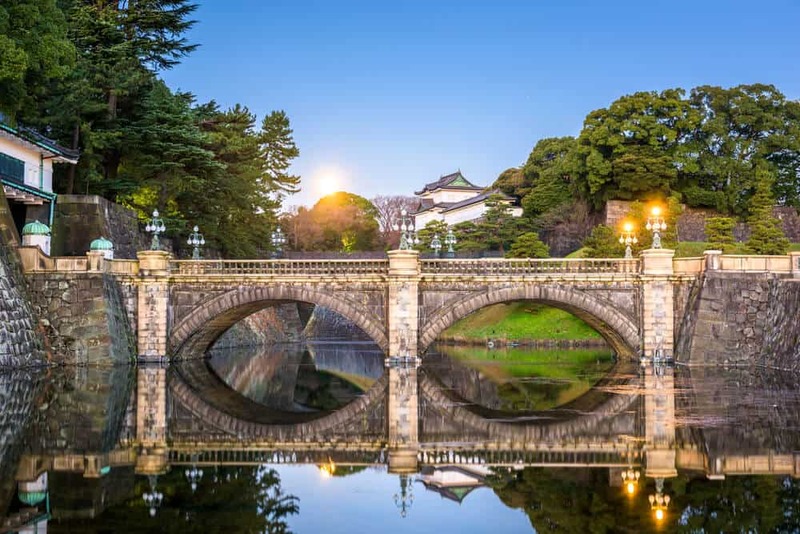 Kinkakuji: Tourist Trap or Treasure?